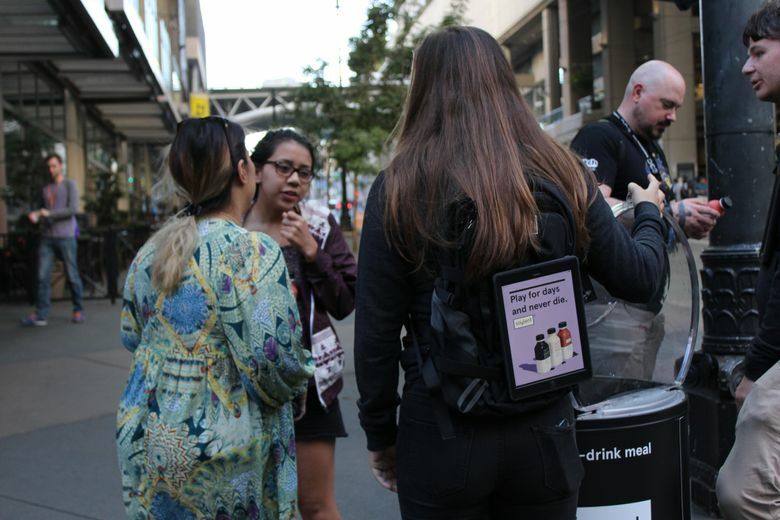 Bellevue startup Nomad Technologies, started by a recent WSU grad, hires students, commuters and eventgoers as “nomads” to carry iPads on their backpacks displaying advertising. Jonah Friedl was trying to persuade his fellow Washington State University students to come eat at the Pullman hotel where he worked and felt like Facebook and social-media ads were his only option. “That’s really where the line stops with millennials,” he said. Physical ads like billboards and posters felt old-fashioned. Then one morning during junior year in 2014, while walking to class after a graveyard shift at the hotel, Friedl looked around at the crowd of students and thought, “Wow, there’s a lot of undivided attention here.” Friedl walked an hour and a half every day: What if he could put a billboard on his backpack? That idea became Bellevue-based startup Nomad Technologies, which hires students, commuters and eventgoers as “nomads” to carry iPads on their backpacks around campuses, metropolitan areas, sports events and trade shows. The iPads display advertising from a client like YouTube, Zipcar, or Limebike — three of the company’s 30 current clients — and the nomads answer any questions from onlookers about ads they have on their backs. Friedl linked up with angel investor Dave Greschler, who founded software company Softricity and sold it to Microsoft in 2006. Friedl grew up down the street from Greschler in Kirkland, and the entrepreneur’s kids were friends of Friedl’s. 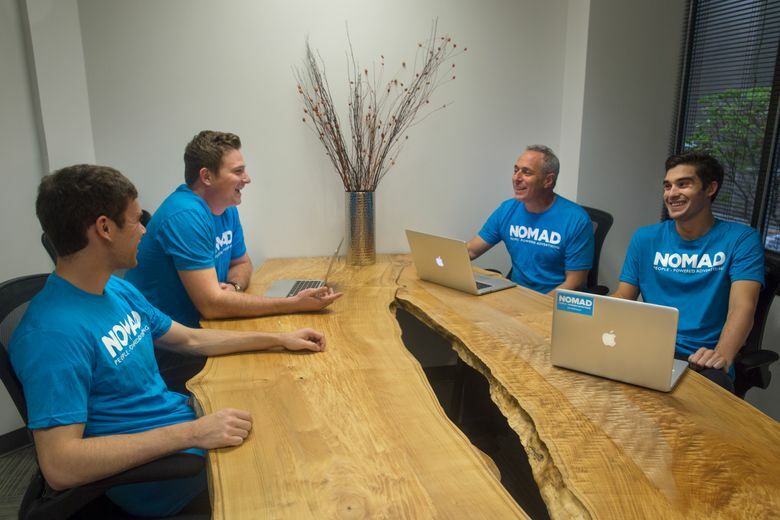 Nomad raised $100,000 this spring from angel investors, including Greschler, who is now COO. The company has four full-time employees, with Friedl as CEO. Prospective nomads can sign up online, give the ZIP code where they walk, links to their Facebook and Instagram pages and their interests. Nomad Technologies uses this information to look for outgoing people who can speak on behalf of a brand. The company doesn’t just focus on college students; it also signs up metro-area commuters. Some nomads have iPads already, and the company just mails them a waterproof case that attaches to a backpack — but most lease their iPads from the company. Nomad Technologies tracks where its walkers go and uses general demographic data to estimate how many eyes would see the iPad ads, using that data for a pay scale — like surge pricing for Uber. Friedl says the company pays, on average, between $10 and $20 an hour, and its nomads usually make about $100 a week. There are around 100 daily active nomad walkers on 11 campuses in four states — including the UW in Seattle — and at events like the PAX gaming festival in Seattle in September. Nomads can make more money at trade shows handing out swag or promotional material.